This article aims to shed some light on the role of the Court of Justice of the European Union on transparency and access to documents. It uses case law as a method to investigate the potential of the Court of Justice jurisprudence for the protection of transparency as a general principle and access to documents as a fundamental right in the European Union. The article employs the concepts of Eurolegalism and the constitutionalisation of rights as a framework to examine the case law of the EU’s highest court. It focuses on the trends established by the Court on access rights by looking at some of the most influential cases that had made history through the years and analyzing their potential to create a body of a reformed administrative law in the EU pertaining transparency. While the Court of Justice may not be the ultimate solution to the problems of transparency in the Union, it has established itself as a driving force in the development of transparency and access rights regime in the EU and may affect their future trajectories in the face of legislative challenges. At the European Union (EU) level, there is an increasing concern about the democratic deficit, which means that the EU suffers from a lack of democracy and accessibility of the ordinary citizens to the EU institutions. Paul Craig provided a definition of the term ‘democratic deficit’ as encapsulating different features such as disjunction between power and electoral accountability (meaning that voters have no role in the legislative agenda), executive dominance (meaning that the Council dominates over other EU institutions), by-passing the democracy argument (meaning that technocrats and national interest groups dominate decision-­making), distance issue (meaning the transfer of issues to Brussels away from nation states), and transparency and complexity (meaning that decision-making is complex with procedures behind closed doors).1 The last feature of this definition is concerned with the secrecy that characterizes the process of decision-making in the EU. As a response to this prevailing culture of secrecy in the European politics, the need for transparency became inevitable. As Héritier argued, ‘The debate about transparency and access to information came about because of the perceived lack of transparency and openness in the complicated European decision-making processes.’2 The EU institutions, namely the Commission, the Council, and the European Parliament are seen responsible for generating this democratic deficit. Carruba argued that ‘The Council of Ministers is not transparent enough in its decision-making, the Commission is not sufficiently accountable to the European public, and that the only directly-elected body of the European Union – the European Parliament3 – does not have sufficient influence in the legislative process.’4 There is a significant concern about the executive dominance in the EU which does not allow for much voice to the elected bodies and, as such, contributes to the democratic deficit. As Follesdall and Hix discussed ‘The design of the EU means that policy-making at the European level is dominated by executive actors: national ministers in the Council, and government appointees in the Commission’5. This article aims to bring the CJEU to the discussions about transparency and access rights, and understand its potential in shaping these discussions, especially in times of political disagreement between other EU institutions regarding the status of these rights. The article contributes to the growing body of literature on the role of the courts on transparency with an analysis of the CJEU jurisprudence. The question to be asked is: ‘What is the role of the CJEU in the promotion of transparency and the right of access to documents in the EU?’ To tackle this question, the research engages with the previous literature on the role of the Court over the years, but especially after 2001 (year of the Regulation No 1049/200117). I use case law as a method to investigate the potential of the CJEU jurisprudence to influence the protection of transparency as a general principle and access to documents as a fundamental right in the EU. Two concepts will be significant for this research: eurolegalism and consitutionalization of rights. The article consists of four sections. In section one, I provide the theoretical foundations explaining the concepts of Eurolegalism and consitutionalization of rights, and exploring the meaning of democratic deficit and its implications. In section two, I analyze the relationship between transparency and access to documents and provide a case law analysis of the CJEU jurisprudence. This section focuses on the new trends that the Court has established in many decisions especially on those which have set new rules for the application of access rights, building on a new body of administrative law in the EU. In section three, I address some implications and counterarguments on the role of the courts, particularly the CJEU. Finally, in section four, I conclude by giving a summary of the potential of the Court in promoting transparency, protecting the access rights of the citizens and shaping the transparency legal framework. The CJEU produced jurisprudence that affected future developments of access rights regime, even before the Charter gained binding authority, and the right of access to documents gained constitutional status with the entry into force of the Lisbon Treaty.30 Babayle argued that until 2001 the Court played a very important role in maintaining at least a ‘minimum level of protection’ for access rights. However, it was after the entry into force of the Regulation 1049 that the CJEU case law significantly influenced the expansion of access rights. The Lisbon Treaty that entered into force on 1 December 2009 recognized the right of access to the EU documents as a fundamental human right. Babayle recognized the contribution of the CJEU in this recognition by arguing that ‘The constitutional progress represented by the Treaty of Lisbon has been boosted by advances in case law.’34 The Lisbon Treaty further formally extended the right of access to documents beyond the three main EU institutions to all the Union institutions, bodies, offices and agencies. This extension has been considered35 to constitute one of the major changes of the rights of access to documents since it was first introduced in the early nineties, but it still has to be reflected in the Regulation 1049. Since this change has yet to be included in the Regulation, it is the responsibility of the CJEU to protect access rights against any violations and make sure that the Treaty provisions are well interpreted in cases of uncertainty and conflict. The CJEU established many well defined rights and an elaborate case law on the protection of fundamental rights on the basis of a vague concept of general principles of the EU.36 This argument is brought forward by Cichowski who stated that ‘As the ECJ rulings bring greater clarity to vague provisions…ECJ precedent can provide the opportunity for subsequent rights claims […] defining what is and is not a lawful practice.’37 Clarity is critical for access rights since there is often space for doubts and questions regarding what practices are considered lawful or not. There is a gap in the EU between the legal provisions and the practice. While the legal provisions seem to have evolved significantly in the last decade, practice has not followed the same path, probably, in part, because of these uncertainties. Sometimes the law is not clear and the line between exceptions and acceptance is blurry. The situation becomes more complicated when the public officials assigned with processing information requests are not very sympathetic about transparency and purposely invent ‘internal rules’38 to by-pass the scope of the legislation. Faced with such behaviour from the public authorities - who should be the guarantors of access rights, but instead become barriers to the realisation of these rights - the citizens are left with only two choices: to file a complaint with the EU Ombudsman,39 or file a claim in courts. In many cases there are not even two choices if the Ombudsman is not successful in his persuasive attempt to restore the denied request. Hence, the courts become the ultimate resort. The purpose of this article is not to make a detailed analysis of the democratic deficit in the EU, but rather to explore the correlation between the deficit and transparency in the Union and how the latter can help address the former. A good start for achieving this purpose is a proper understanding of the term. The definition from Paul Craig provided at the beginning of the introduction of this article encompasses the most important features of the democratic deficit problem. When explaining the meaning of the term, Craig looked at the disjunction between power and electoral accountability, the executive dominance, the by-passing of the democracy argument, the distance issue, and transparency and complexity.40 As this last feature demonstrates, for Craig, there is a direct correlation between transparency and democratic deficit. In the European legal order, transparency is considered to be one of the most important tools to deal with the democratic deficit in the Union. Transparency has been rendered a very significant role to the strengthening of democracy in the EU in broader terms. After the Maastricht Treaty41 came into force, the competences and domains of action of the Union were expanded substantially creating legitimacy concerns. As a result, the criticism on the democratic deficit of the EU institutions grew stronger, and the demand for more transparency became inexorable. In this context, the principle of transparency was embraced as an essential instrument in the pursuit of more democratic legitimacy. In response, a Declaration on the Right of Access to Information42 was attached to the Maastricht Treaty among 33 other Declarations attached to the Treaty. It is clear in this Declaration that transparency is a tool to strengthen the democratic nature of institutions (hence, to address the democratic deficit problem to some extent). The Declaration was followed by the adoption of a ‘Code of Conduct’ concretizing the rules on public access to the Council and the Commission documents.’43 Then, in 1997, the Amsterdam Treaty44 introduced Article 255 EC45 Treaty, which established a full right of access to documents. In 2001 the ‘Code of Conduct’ was substituted by the current Regulation 1049, which is the European Union’s equivalent of an access to information law. It grants members of the public and legal entities the right to access documents held, transmitted or received by EU institutions. This Regulation recognizes the importance of openness for the administration to enjoy greater legitimacy and ensure more accountability to the citizens. Legitimacy and accountability are some of the features of the democratic deficit that this Regulation attempts to address. The wording of the Regulation demonstrates that its intention is ‘creating an ever closer union among the peoples of Europe, in which decisions are taken as openly as possible and as closely as possible to the citizen.’46 Indeed, dealing with the democratic deficit requires addressing issues of power, distance and transparency (which are its features, according to Craig). Because transparency has such a special role in the EU’s democratic process, public access to documents becomes an important legal instrument for the practical application of the general principle of transparency. The EU law recognizes access to documents as a fundamental right, which serves a higher objective – it inspires and enhances democratic participation that reduces the democratic deficit. Kelemen argued that ‘By emphasizing transparency, accountability and individual rights, European law is enhancing opportunities for public participation in governance and thus promises to improve the quality of democracy across Europe.’47 The Lisbon Treaty has implanted the provisions on the right of access to documents at the beginning of the Treaty on the Functioning of the EU (TFEU) among those provisions of general application. Furthermore, with the Charter of Fundamental Rights having ‘officially’ gained obligatory legal status, the entry into force of the Lisbon Treaty has firmly granted the status of a fundamental right to access to documents. This recognition has influenced the interpretation of the scope, limitations and protection of access to documents right. Now, I look closely to the Regulation 1049 and the role of the CJEU in its interpretation. In addition, the Regulation includes a particular exception51 intended at protecting decision-making processes from being ‘seriously undermined’ by the disclosure of documents. Regarding this provision, the CJEU has become more stringent to admit its applicability. Cases like MyTravel (to which I will return below) demonstrate that the CJEU has made it harder for the institutions to apply this exception. This attitude of the CJEU has certainly given preferentiality to transparency over secrecy making it much tougher for the institutions to refuse requests without proper justification. The role of the CJEU in construing the meaning of Regulation 1049 has been crucial. Heremas argued that ‘In thus interpreting the Regulation, the Court of Justice of the European Union has produced a sizeable […] body of case law which shapes to an important extent the right of public access to documents within the EU.’52 It can be concluded from the CJEU’s recent case law (in cases like Access Info Europe and Turco) that, in principle, the Court calls for openness of legislative processes, even for those which are still ongoing. The Court has preferred to apply a broader concept of openness and its applicability, expanding the margins for the application of the principle of transparency and access regime, and creating more space for public participation in legislative processes. An important role has been attributed to the CJEU especially to the recasting process53 that has been haunting the Regulation 1049 over the last decade. During this time, every effort to change the Regulation has found itself in a political stalemate. The negotiations between the European Commission and Parliament have not been successful and there has been on-going tension from 2006. In 2008, the European Commission made available its proposed amendments to Regulation 1049.54 There were concerns that some of the Commission’s proposed changes would bring the Regulation 1049 below the prevailing European standard and the European Parliament strongly opposed the idea. Since the revisions of the Regulation are lingering for about six years in the stage of first reading in the European Parliament, the CJEU has been increasingly called upon to interpret the provisions of Regulation 1049. Many cases regarding provisions of the Regulation 1049 do not end up in the Court for many different reasons. However, those that have made their way up to the CJEU have created a body of jurisprudence which has significantly affected the interpretation and implementation of various articles in the Regulation. The result is a fast-growing body of case law pertaining to access to documents. The recasting process of the Regulation has demonstrated that in a situation of a political failure and a fight for authority and power between the EU institutions, the CJEU situates itself as a powerful body which is able to stabilize the political imbalances in the EU. Babayle disputed that ‘both the Council and Commission share a common reservation, if not a common hostility towards an open interpretation of Regulation (EC) No 1049/2001…It has fallen to the judicature to provide arbitration and define clear-cut rules of behaviour, by balancing the interests in play.’55 When any negotiations between the European Parliament and the Commission seem helpless, the CJEU offers a way out by developing a body of case law which meaningfully influences the access to information regime in the EU. Due to this legislative ‘paralyzed state’, the Court is at present the main ‘evolutionary force’ in the EU’s access to documents’ policy. Hirschl explained: ‘the rapid growth of supranational judicial review in Europe as an inevitable institutional response to complex coordination problems deriving from the systemic need to adopt standardized legal norms and administrative regulations […]’56 Considering that any future legislative development will need to consider the Court’s jurisprudence, its role becomes imperative. The CJEU’s case law has led to a far-reaching guarantee of transparency and access to documents in Regulation 1049. The purpose of this regulation is described in recital (4) as ‘to give the fullest possible effect to the right of public access to documents.’59 Confirming these fundamental principles, the Court has emphasized in its established case law that exceptions to the right must be interpreted and applied strictly. There is a growing body of jurisprudence that speaks about the importance of access rights in the EU. 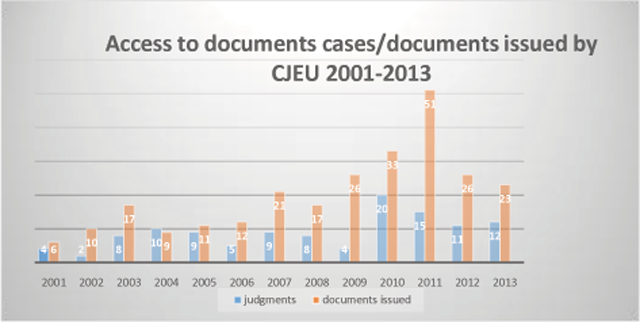 A significant number of cases on access to documents have been brought before the CJEU over the years from 2001–2013, which is the period I have studied. I looked at the statistics on the CJEU’s website and noticed that the number of cases has increased gradually (however not in a pattern) after 2001, year of the Regulation 1049. For example: from 30/05/2001 to 21/10/2013 the General Court and the Court of Justice gave 5625 judgments (of which 117 were on access to documents, or 2.08 %) and issued 44964 documents (of which 511 were on access to information, 1.14%). Documents issued here include various forms such as applications, orders, views, judgments, removals, etc. Table 1 gives information on judgments and documents issued by the Court each year from 2001 to 2013 (October 21). As can be seen in the table, the percentage of access to documents cases in comparison with all cases is fairly small, but not inconsequential. It is important to see that the number of cases and other documents issued by the Court is growing. The chart (Fig. 1) below displays all judgments/documents issued by the CJEU on cases about access to documents specifically or related to them. A significant increase of activity is noticeable in the years 2010 and 2011. This is the year in which the Commission’s proposal for changes in the Regulation 1049 had its first unsuccessful reading in Parliament. I suspect that this increase is attributed to the political deadlock associated with the recasting process of the Regulation 1049 which lead many EU institutions to seek guidance from the CJEU for the interpretation of this Regulation. Source: Chart prepared by the author using data from CJEU website62. Not all the cases brought before the CJEU carry the same weight and not all of them have been given the same treatment. There are some cases (which I will go over below) that deserve closer attention as landmark cases63 that could significantly impact the future of policy-making and creating new a body of administrative law in the EU pertaining to transparency and access to documents. Transparency is critical to protect democracy. The access rights serve to enhance transparency; this guarantees greater legitimacy of institutions, which translates to a more democratic nature of the institutions. The CJEU has recognized this truism repeatedly in a number of cases. For instance, in the landmark case Access Info Europe (Council v Access Info – C–280/11)64, the CJEU had the unique opportunity to provide guidance on the exceptions under Article 4(3)65 of the Regulation 1049. The Access Info case offered to the CJEU, for the first time in its history, the chance to clarify the precise extent of the duty to ensure transparency imposed by the Regulation on the institutions when they are acting not only in their legislative capacity, but also in the course of a legislative procedure. The case was between Access Info Europe66 (AIE) and the EU Council. When the proposal for changes to the Regulation 1049 was made, AIE submitted a request to the Council for a copy of the report which contained information on the Member States’ reactions to the Commission’s proposal for the reform of Regulation 1049. The Council only granted AIE partial access to the documents requested by providing the transcripts of discussions but not the names of the countries that were putting forward proposals for the modification of the Regulation. After the refusal for full access, AIE filed an appeal with the General Court, which ruled on 22 March 201167 in favour of AIE. It provided AIE with full access to legislative documents, including the names of Member States putting forward proposals. The Council appealed the decision at the CJEU which ruled on 17 October 2013 in favour of AIE and about disclosing the requested documents by the Council. The case was considered a tremendous victory among access to information advocates, but especially NGOs engaged with human rights issues. Since an NGO won the case, this may have further implication in the future for better NGO involvement in the EU decision-making in the course of a legislative procedure. In another case, known as Turco (Turco and Sweden v Council69), the CJEU made it clear that legal opinions on legislative procedures should be disclosed to the public even if the procedure is still ongoing. However, if a specific legal opinion is of a particularly sensitive nature or particularly wide scope going beyond the context of the legislative process in question, it should not be disclosed. Turco is particularly important because it sets the rules for legislative procedures which should be opened to scrutiny. This decision confirms that the principles of transparency and openness are guiding principles for the CJEU, because as the Court put it ‘Openness contributes to strengthening the principles of democracy and respect for fundamental rights.’70 In addition, it could have significant ramifications for a review of freedom of information legislation (the recast of the Regulation 1049), currently underway in the European Parliament. Ruling on this case, the CJEU stated that ‘Wider access should be granted to documents in cases where the institutions are acting in their legislative capacity, including under delegated powers, while at the same time preserving the effectiveness of the institutions’ decision-making process.’71 This case is about whether there is an ‘overriding public interest’ in the disclosure of documents containing the advice of an institution’s legal service on legal questions arising when legislative initiatives are being debated. The case dates back to 2002 when a former Italian Member of the European Parliament, Maurizio Turco, asked for copies of documents discussed by the EU Justice Ministers on a proposed directive on the reception of asylum applicants. Turco also asked to see the legal advice the Council had received from its in-house legal department on the proposed legislation. The Council declined to release the legal opinion, claiming that the advice was restricted to those with privileged access and that there was no overriding public interest in its disclosure. The Court of First Instance subsequently refused to annul the Council’s decision, holding that the public interest in disclosure did not apply in this case. Backed by Sweden, Turco appealed the decision to the CJEU. The Court emphasized that the importance of transparency in the legislative process and the strengthening of the democratic rights of European citizens justified disclosure. The CJEU reasoned in favour of the appellant and ordered the disclosure of the Council legal service opinion defending the democratic right of European citizens to scrutinize the information that has formed the foundation of a legislative act. Granting access as openly and as closely as possible is a rule introduced in the Regulation 1049 in Recital (1), and than reintroduced in Recital (6), which emphasizes this principle for cases, where the institutions are acting in their legislative capacity. The CJEU jurisprudence has established that a wider access should be granted in these cases to reduce the internal ‘space to think’ or the ‘negotiation space’, which the institutions want. The idea is that institutions cannot create their ‘own free-thinking zone’ in which they can be totally free from public scrutiny. The CJEU has confirmed that in order to protect the decision-making process within the Union it is necessary to exclude any general confidentiality in the field of legislation. The Court recognized this principle in cases such as the Access Info, Turco, (which were analyzed above) and MyTravel. The CJEU has offered excellent guidance to the institutions by deciding on cases that deal with information that comes from the Member States, but are on the possession of the Union institutions and are requested on the basis of Regulation 1049. One of such cases is Sweden v Commission (C-64/05 P)77 ruled on 18 December 2007. This is a leading case because it sets new rules for the Member States regarding their access to documents regime. The case establishes that Member States do not have a right of veto over their documents. It is up to the institution to have the final say on whether the document will be released as they are the ones that are legally liable for that decision before the CJEU. The Member State must explain how and why that document is covered by one of the exceptions found in Regulation 1049/2001 and they cannot simply refer to their national law on access to information. The Court acknowledges that Member States do not have ‘an unconditional right of veto’, but they can object to the disclosure of documents, only if it gives proper reasons grounded on the exceptions set out in the Regulation. In another decision, the CJEU had the opportunity to settle issues involving a national law which prohibits a third party access to documents. In the case Donau Chemie (C-536-11),83 decided on 6 June 2013, the CJEU confirmed that the right of access to documents strengthens the functioning of EU competition law. In addition, the case establishes boundaries and provides guidelines for the national courts on how they should consider cases on access to documents. The Court concluded that the exercise of weighing up the interests of disclosure must be conducted by national courts on a case-by-case basis, according to national law, and taking into account all the relevant factors in the case. Only once this exercise has been completed can a national court refuse access to certain documents. Otherwise, access should not simply be systematically denied. In Donau Chemie the Court asked whether a national law that prohibits access is compatible with EU law. In this case the CJEU stroke down an Austrian law which made access to documents, including leniency materials, on a Court’s cartel file almost impossible for third party damages applicants. The Austrian provision did not allow for any balancing of interests, since access to the file could only be granted with the consent of the addressees of the decision. The CJEU noted that the public interest in an effective leniency programme should be balanced against the applicant’s interest in disclosure and that this balancing act should be made for every single document on a case file. Therefore, the Austrian provision was in violation of European law which gives individuals the right to claim damages for loss and entitles them to seek full compensation for their actual loss, as well as for loss of profit, plus interest. Regulation 1049 includes privacy as one of its exceptions in Article 4(1). Privacy is considered to be of great significance in the EU and, as such, enjoys the protection of a mandatory exception in the Regulation. Among the most important cases brought before the CJEU that deal with the circumstances when the rights of access conflict the rights of privacy is the Bavarian Lager v Commission (C-28/08 P)84. In this case the CJEU had to provide guidance on balancing of the relationship between Regulations 45/2001 on Personal Data Protection85 and 1049/2001 on Public Access to Documents - a very delicate and controversial relationship. There has been an on-going debate among lawyers and scholars regarding the rights of privacy/­personal data and information/access to documents. When they conflict each other there has to be a balance of these rights without one undermining the other. The most important thing is to be able to identify when there is a conflict and which one should take precedence over the other, privacy or access. This balance has to be stricken only on a case by case basis. The CJEU and General Court were in opposition to each other on this case just because of this blurred and complex relationship. In Bavarian Lager, the CJEU had to clarify that ‘communication of personal data appearing in a document held by an institution constitutes not only public access to a document under Regulation 1049, but also a processing of personal data under Regulation 45, which the General Court did not take into account.’86 Although the ruling in this case was not in favour of access to documents, the decision will definitely have a significant impact on the future relationship between privacy and access to documents rights of the EU citizens. Bavarian Lager87 required access to the full minutes of the meeting held in the context of an infraction procedure against the UK- a procedure following from a Bavarian Lager complaint lodged at the EU Commission. Despite its demand, Bavarian Lager had not been invited in the meeting. The Commission decided to release the substance of the document, but blanked out the names of the five EU trade organization representatives who had not given their consent for disclosure. To justify its decision, the Commission depended on Regulation 45/2001 and stated that the applicant had failed to establish an express and legitimate purpose or need for such disclosure. Hence, the Commission declined to grant access, based on the exception for the protection of the private life and integrity of those participants contained in Article 4(1)(b) of Regulation 1049. The case went to the General Court which ruled to invalidate the Commission’s decision of rejecting the Bavarian Lager’s request. Then, this case was appealed by the Commission to the CJEU where the General Court’s decision was reversed. The CJEU found that names fell under the concept of ‘personal data’ and that the making those names public amounted to the ‘processing of personal data’. While investigating the potential undermining of the public interest, the European General Court in its decision88 relied on the ECtHR case law. ECtHR’s jurisprudence distinguishes what constitutes an ‘unjustified interference in the private life’ within the meaning of Article 8 of the European Convention on Human Rights.89 The General Court concluded, however, that despite the breadth of the meaning of ‘private life’ not all personal data are necessarily covered by the concept and not all personal data are able to destabilize the private life of the person concerned. Hence, the General Court assessed whether the sole disclosure of the names of the participants to a meeting, not including the specific opinions expressed by them, would truly and effectively undermine the protection of their privacy and integrity. It councluded that this was not the case since the participants had appeared in the meeting in their professional capacity as part of a collective body. However, contrary to the General Court’s reasoning, the CJEU found that it had to respect the ‘equilibrium’ which the legislator has established for the protection of a person whose personal data could, in certain cases, be transferred to the public. Thus, the CJEU agreed with the General Court that the communication of the full minutes of the meeting, including the list of participants would amount to a ‘processing of personal data’ within the meaning of Article 2 of Regulation 45/2001. However, the Court held that the Commission was correct to seek the consent of the data subjects and to remove the names of participants whose consent had not been given. There are some concerns that deserve attention and need to be taken into consideration about the role of the courts in general, and in particular the CJEU. First, it should be understood that the Court cannot order the EU institutions to release documents. Instead, it has a more limited power to annul an institution’s refusal to release them. As Sarmiento put it ‘CJEU has no power to annul national legislative, executive or judicial acts; it can only declare their compatibility or incompatibility with EU law.’99 Despite this fact, the governments have shown a satisfying level of compliance towards the Court’s rulings. This could be explained by eurolegalism, which informs that judicalization of the policy-making process makes the governments keen to obey to the court decisions. By achieving this goal, Blauberger observed that ‘the ECJ triggers broader reforms at the national level.’100 In the case of the access rights and transparency regime, the CJEU jurisprudence has provided many precedents that deal with the relationship between national and union policies and legislation (IFAW, the Donau Chemie). In other words, as long as the courts deliver justice and act as guardians of citizens’ rights it does not matter if they are elected or not. Regarding the access rights courts have proven that they have played a significant role in upgrading those rights to a higher status which in turn has provided better rights’ protection. The role of the courts in transparency and access to information is important in two ways. First, courts are guardians in protecting citizens’ rights of access and providing remedies against any abuse of such rights by the government. Second, the role of the courts becomes exceptional when they act as reformers in transforming access rights regimes. Courts are considered to be mechanisms that uphold the rule of law. In democracies, they are deemed to be the main pillars in maintaining the balance of power among the three branches of government. The CJEU, in particular, has established a high reputation not only at the EU level, but internationally as well. Sweet argued that ‘The CJEU is today one of the most powerful high courts in the world.’115 Regarding the access rights regime, the examples brought in this article from the CJEU jurisprudence demonstrate that this Court has the potential to transform this regime and act as an ‘evolutionary’ force in bringing about change. Both Eurolegalism and the constitutionalization of rights serve as a useful framework for assessing the role of the CJEU in promoting access to documents as a fundamental human right and transparency as a principle which encompasses this right. As Kelemen put it ‘For enthusiasts, Eurolegalism may promise heightened legal certainty and transparency.’116 In addition, employing the constitutionalisation of rights, one understands the empowerment of the Court. The Court contributed through case law to raise access rights at the constitutional level. In this sense, the Court’s case law has led to the empowerment of the fundamental rights. Much of the increased powers of the CJEU, the creeping constitutionalization through case law and the value of an independent judiciary point to political constitutionalisation at the EU level. Hirschl claimed about a ‘constitutionalization of rights and the empowerment of courts as inevitable outcomes of a social and political need.’117 This theory may explain the increasing transparency and public accountability of legislative and executive branches by means of a strong and independent judiciary. The CJEU oversees a strong body of administrative law, and acts as a federal-like multi-level court system that can hold these two branches (executive and legislative) to such a body of administrative and constitutional law. As Sweet argued, ‘the legal system … sustained an on-going judicialization of policy-making within many important domains. The Court’s rulings routinely required the Member States and the EU’s legislative organs to produce new law.’118 While this alone may not suffice to address the problem of democratic deficit in the EU, which encompasses various problems, it can influence some of its features beginning from transparency. The CJEU has had a significant role in the interpretation of the right of access, and settling disputes arising from the violations of this right. In the Turco case, the CJEU ascertained that all documents drawn up in the course of a legislative procedure shall be made ‘directly accessible’. Moreover, in Access Info, the Court ruled that possible criticism by the public and media are not sufficient reasons to withhold disclosure during the legislative processes. In the light of the CJEU case law, national provisions can only be invoked when the Member States’ documents do not have an EU character. Moreover, as IFAW has settled Member States must prove the adequacy of their national provisions under the conditions laid down in Article 4(1)–(3) of the Regulation 1049. As shown above, the CJEU has developed a case law which will affect the future developments of the EU Administrative Law. It has created guiding principles for the EU institutions to follow in administrative procedures. Recently, with the recasting process of Regulation 1049 being stuck in a political deadlock, the role of the Court becomes more prominent. The Court’s decisions have offered solutions when political negotiations have failed. In this context, the Court relaxes tensions created in the political realm. Regarding the data gathered for this research, one can notice that the number of the cases on access to documents is not very high. However, given that the right-to-know is never a huge portion of the Court docket, the numbers are significant. The increasing number shows that the Court is seen more and more as a reliable institution which strives for a balance of interests, but leaning towards public interest most of the times. In recent years, the CJEU has paid particular attention to ensure respect towards transparency and particularly the right of access to documents. Since the entry into force of Regulation 1049 13 years ago, the Court has ruled on many issues raised by requests for access to documents. While interpreting the Regulation, the CJEU has created a considerable body of case law which contours to an important degree the right of public access to documents within the EU. Especially now, when the recasting procedure of the Regulation 1049 has been a hostage of political disagreement, the interpretation of the Regulation by the Court, becomes even more imperative. Every step in the recasting process should pay careful consideration to the case law of the CJEU. On a last note, one should be prudent to not overestimate the role of the Court in the protection of access rights and promotion of transparency as a panacea to the problem of democratic deficit. However, the findings in this article enforce the idea that the CJEU could transform access rights regime in meaningful ways. 3The role of the EP with the introduction of the co-decision procedure is growing. However, because the legislative power in the EU is divided between the EP and the Council, very often it is the Council who takes over on most decisions. An earlier version of this article, was presented at the 3rd Global Conference on Transparency Research (24–26 October 2013, Paris, France). I am grateful to the participants in the Conference for their valuable feedback, and to the Panel Chair Alberto Alemanno. A special thanks goes to my supervisor, Professor Liora Salter (Osgoode Hall Law School) for the support and encouragement on the publication of this article.